In today’s world security is a primary concern for any business or building owner. Whether protecting against simple tail-gating, theft or even potentially serious threats, monitoring and controlling the traffic flow in and out of your facility is a crucial part of any security plan. At Piedmont Door Solutions we offer a range of products which can be tailored to meet your specific security needs. Whether your site is industrial, non-public or a Class “A” property we have a solution that will both fulfill your need for security and appealing design. In this office building the client want to maximize security, including integrated tailgating deterrents, while preserving an elegant appearance. 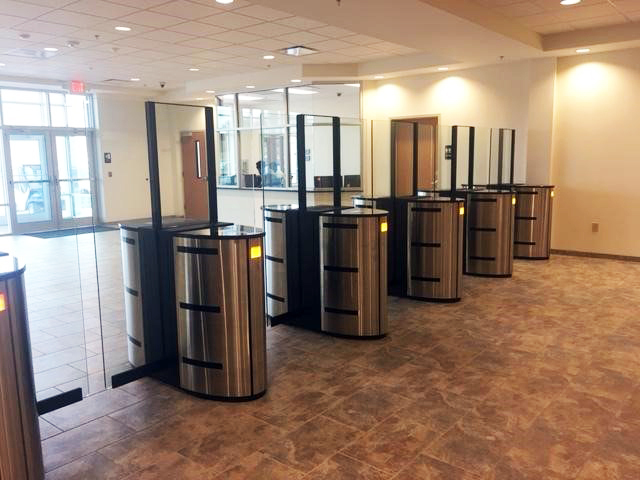 With those goal in mind we review our product offerings and selected Boon Edam’s Speedlane 996 optical turnstiles for this installation. The Speedlane 996 offers the elegance of all glass, tall paneling, handicapped accessibility and industry leading tail-gating detection. These particular models include Boon Edam’s high density beam matrix which maximizes detection in a high traffic environments. The talented team from our Greensboro operation worked with the client to select and install the perfect solution for their building. With an expert touch they have concealed the rigorous security measures of these turnstiles beneath a high class finish and rich design aesthetic.